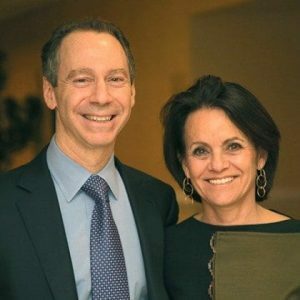 The chair of Johns Hopkins University’s board of trustees and his wife have committed $10 million to give students new opportunities in international relations and to enhance scholarly work on major world issues. The Aronson Center for International Studies, to be named for donors Jeffrey H. and Shari L. Aronson, will promote closer ties between the university’s graduate-level Paul H. Nitze School of Advanced International Studies in Washington, D.C., and the undergraduate international studies program at the Krieger School of Arts and Sciences in Baltimore. The center will include two new professors who will teach students and collaborate with faculty in both schools. It will also oversee funding for undergraduates who want to do research or study abroad, including at SAIS’s international campuses in Europe and China. Ronald J. Daniels, president of the university, called the Aronsons’ gift “visionary,” saying it “reflects their unwavering dedication to Johns Hopkins, their perceptive evaluation of a key area for our growth, and their support for One University, our initiative for creating greater connections among our campuses. The new Aronson Center professors, funded by $4 million in the gift directed to SAIS, will each teach undergraduate courses at the Krieger School and graduate-level courses at SAIS. The Aronson Distinguished Professor will be a senior scholar whose work is focused on the Middle East. The other new appointee, the Aronson Professor, will be an expert in international relations and comparative politics, international economics and social development, or conflict resolution. The two faculty members will work together to develop new and innovative approaches to the theory and practice of international relations. The Aronson Center will also have an endowment to support undergraduate intersession and summer experiential learning trips and to enhance overseas undergraduate experiences, including at the SAIS campuses in Bologna, Italy, and Nanjing, China. The endowment will also fund symposia, undergraduates studying at SAIS, and scholarly projects shared between the two schools. Jeff Aronson, a trustee since 2006, is a co-founder and managing principal of Centerbridge Partners LP, an investment management firm. He graduated from Johns Hopkins with honors and earned a law degree at New York University. In addition to chairing the Johns Hopkins University board since 2012, he is a trustee of the New York University School of Law. Shari Aronson is a member of the Washington-Baltimore Program in Social Policy Advisory Board at the Krieger School. She is a trustee of Lehigh University, the Jewish Museum of New York, and Sunrise Association. She graduated from the University of Delaware in 1980 and earned an M.B.A. from Pace University in 1985. The couple’s two daughters are Johns Hopkins graduates; their son graduated from Lehigh. The Aronson gift counts toward Rising to the Challenge: The Campaign for Johns Hopkins, an effort to raise $4.5 billion, primarily to support students, research and discovery, and interdisciplinary solutions to some of humanity’s most important problems. The campaign, supporting both the university and Johns Hopkins Medicine, began its quiet phase in January 2010, was publicly launched in May 2013 and is targeted for completion in 2017. More than $3 billion has been committed so far.